A new form of medication for alcohol dependence is a useful adjunct tool for managing cravings at the start of recovery, but experts agree psychosocial support and the 12 steps are still a necessary part of the long, winding road to sobriety. According to the National Institute on Alcohol Abuse and Alcoholism, almost 18 million adults in the United States are considered alcoholics or have alcohol problems. However, the 2007 National Epidemiologic Survey on Alcohol and Related Conditions reported that less than 25% of those with alcohol use disorders have ever received treatment, and treatment rates have declined compared with those from 10 years ago, even with an expanded range of treatment options—medications to reduce cravings, cognitive behavioral therapy, 12-step programs, and telephone/Internet support and monitoring. A relatively new medication—extended-release, injectable naltrexone (see below)—is creating a stir in the treatment community following the results of a recent study demonstrating significant improvements in quality of life in approximately 600 patients assigned to receive injectable naltrexone or placebo over 24 weeks plus a standard psychosocial intervention. This study is one of the few to measure quality of life associated with pharmacotherapy. “Extended-release, injectable naltrexone (380 mg) showed meaningful and significant improvements compared to the placebo group in the quality of life domains of mental health, social functioning, general health, and physical functioning,” reports Helen M. Pettinati, PhD, lead study researcher, as well as a professor of psychology in the department of psychiatry and the director of the division of treatment research at the University of Pennsylvania School of Medicine. This finding is significant, says Pettinati, because the study population showed broad pretreatment quality of life impairments and reductions in drinking from pretreatment levels correlated with improvements in quality of life. “These findings reinforce the notion that treatment of alcoholism, whether it’s by medication or psychotherapy, does work,” says Allen Zweben, DSW, a professor and the associate dean for academic affairs and research in the School of Social Work at Columbia University and a coresearcher with Pettinati on other studies. For many years, medications for treating alcohol dependence have been rejected by 12-step programs such as Alcoholics Anonymous (AA), as well as many inpatient rehabilitation centers. But views have since changed, and medications are now seen as useful adjuncts to, but not replacements for, counseling, cognitive behavioral therapy, and other psychosocial therapeutic interventions. “Medication-assisted treatment for alcoholism has been accepted in the medical community for many years; disulfiram has been in use since 1949, oral naltrexone was approved for use in 1994, and acamprosate in 2004,” says Thomas Best, MD, director of The Meadows. The reasoning behind the injectable formulation of naltrexone, which was approved in 2006, is improved compliance, since patients do not have to remember to take a daily pill. “The fact that this medication is gaining wide acceptance in treatment centers across the U.S. is surprising in light of earlier resistance,” says Katherine van Wormer, PhD, MSSW, a professor of social work at the University of Northern Iowa and a coauthor of Addiction Treatment: A Strengths Perspective. In the past, 12-step program supporters have opposed all medications to reduce cravings, primarily because they believe medication use is just substituting one drug for another and that abstinence requires substantial lifestyle changes not addressed by medication. She attributes the growing acceptance to the addition of injectable naltrexone to treatment plans in leading centers such as Hazelden and The Meadows, as well as strong endorsements for medical treatment from government agencies, such as the National Institute on Drug Abuse and the National Institute on Alcohol Abuse and Alcoholism. “There is a much greater tolerance for medication use now in Alcoholics Anonymous, especially when the drug is prescribed for patients with a dual diagnosis of major mental illness and alcohol dependence,” adds Garrett O’Connor, MD, president of the Betty Ford Institute and former chief psychiatrist for the Betty Ford Center. By reducing cravings, injectable naltrexone may serve as an avenue for participation in the long therapy process toward recovery and long-term abstinence, he says. However, the Betty Ford Center has not added naltrexone to its formulary because the drug offers only a reduction in drinking days and not total abstinence from alcohol. O’Connor adds that the center’s policy is to make all patients aware of injectable naltrexone as an available treatment option and to refer those who elect to try this approach after discharge to a physician in their area who prescribes and manages the medication. O’Connor agrees that the injectable version may offer hope for better compliance during the first month of treatment vs. oral naltrexone taken daily by the patient. “In conjunction with appropriate counseling and motivated participation in AA (including having a sponsor, performing the 12 steps, and attending frequent meetings, preferably daily), an injection might offer one month of protection from cravings that could help reduce heavy drinking (relapse) and jump-start the recovery process,” he says. However, he notes that evidence for the efficacy of injectable naltrexone is still in the early stages, and no long-term studies documenting an improvement in quality of life beyond 24 weeks have been conducted to date. In contrast, there is abundant evidence documenting eight years or more of abstinence with improved quality of life in 12-step programs, specifically AA. O’Connor says that patient report data from the Betty Ford Center’s focused continuing care program, which follows patients for one year after discharge from treatment, shows that rigorous and ongoing participation in 12-step programs such as AA, which has been in existence for 73 years, is very effective for maintaining sustained sobriety. Individuals who are working the 12 steps with a sponsor and participating in three or more weekly AA meetings have a 94% chance of remaining sober, while those participating in one weekly meeting or less have only an 80% chance. Medications alone have not been proven to contribute to sustained abstinence (greater than one year). While the recent study by Pettinati and colleagues supports the value of injectable naltrexone for the treatment of alcohol dependence when added to psychosocial intervention, some addiction treatment professionals fear that medication use will begin to be overemphasized, and behavioral therapies such as 12-step programs could fall by the wayside. Although participation in 12-step programs is increasing, there is speculation—and fear—that off-label use of the naltrexone injection (alone, without conjunctive psychosocial therapies) could lead to its misapplication for treating alcohol dependence. “My fear is that naltrexone and other medications will replace much of the therapy that is presently the hallmark of substance abuse treatment,” says van Wormer. The counseling that individuals in alcohol rehabilitation programs currently get helps them reduce stress and work on relationships, communication skills, trauma issues, domestic violence issues, and other co-occurring disorders that frequently are a factor in alcohol dependence. Studies that emphasize cost-effectiveness and short-term success in reducing alcohol cravings could result in less specialized treatment, such as family treatment or individualized counseling, since research suggests that naltrexone plus brief standardized therapy is the most cost-effective. “I think we need individualized counseling as well. It is my personal opinion that these underlying problems have to be worked on and that medications such as naltrexone can help in the short run, but that eventually people in recovery would resume their old habits without individualized treatment,” van Wormer explains. While publicized studies have suggested that once-monthly naltrexone could be more cost-effective than current oral daily medications, its cost, estimated at $750 to $850 per injection, is not currently covered by insurance on a consistent basis. Other medications are cheaper and reimbursed by insurance providers. So, for the time being, cost may actually be what keeps patients from using injectable naltrexone. Cost issues aside, reducing cravings with naltrexone does not bring about the behavioral changes required for long-term abstinence, O’Connor says. If injectable naltrexone, or any medication to reduce cravings for alcohol, is relied on as a primary treatment, he believes there is a high likelihood that individuals will assume the medication is a cure and will not be as motivated to participate in the psychological, behavioral, and spiritual therapies that are, in his opinion, necessary for long-term sobriety. “We need a good marriage between the therapeutic recovery process and medications that help but do not impede the evolution toward recovery. This process involves working through shame, guilt, grief, and loss while at the same time making amends and restitution to family and others for the damage caused by the alcoholic’s addiction. In the absence of ‘authentic suffering’ in the recovery process, relapse is much more likely to occur. Medication improperly prescribed can result in a false illusion of recovery that lacks a solid psychological, social, and spiritual foundation,” O’Connor explains. Although the recovery process facilitated by inpatient rehabilitation, follow-up counseling, and properly implemented 12-step programs is painful, it is necessary to ensure better recovery and a higher long-term success rate, he believes. Social workers in the addiction treatment field can expect increasing numbers of clients interested in or already being treated with injectable naltrexone and other medications intended to reduce cravings and heavy drinking. Social workers can work along the continuum of recovery from alcohol dependence, from initial motivation to obtain treatment to support during inpatient rehabilitation programs to counseling and after care during long-term recovery and abstinence. Because individuals often do not have the self-discipline to begin treatment for alcohol dependence, a counselor, preferably one trained in motivational interviewing, needs to help them get motivated, says van Wormer. Social workers can describe the medication and its effects to see whether it seems appropriate for the client in the early stages of treatment and then refer the client to a doctor who is known to be willing to prescribe this medication. The choice should always be the client’s, she emphasizes. Injectable naltrexone may be useful for clients who want to quit drinking altogether, since many clients would prefer to try to drink moderately first, and if that fails due to lack of control, then learn about whether medications to support initial efforts could help. “Social workers may find clients on these medications to be sober and therefore more amenable to treatment. Pharmacotherapy is directed at the disease aspect of alcoholism and therefore could help reduce the stigma. Social workers could find their work enhanced with those clients who have their cravings under control thanks to injectable naltrexone,” van Wormer notes. “I would suggest that social workers treating patients with alcohol use disorders establish a professional relationship with a physician practicing addiction medicine. A good resource for locating providers of this type of medical care is the state chapters of the American Society of Addiction Medicine,” Best advises. 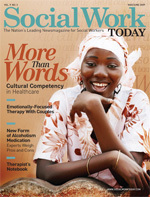 “While I do fear this medication could medicalize treatment to the point that the social work contribution will be minimized, at the present time, however, it is helpful and can reach people in medical settings who would otherwise be reluctant to undergo substance abuse counseling,” says van Wormer. Ideally, medications such as injectable naltrexone should be integrated into a comprehensive treatment program that includes AA, complemented by select medications when necessary and by cognitive behavioral therapy or motivational interviewing. “Recovery from alcoholism is a culture shock, moving from the culture of addiction to the culture of recovery,” O’Connor explains. Injectable naltrexone may help an alcoholic struggle onto the path toward recovery by temporarily reducing cravings and heavy drinking, but, in the long run, therapies such as 12-step programs remain the treatment of choice to help individuals develop the behaviors that support long-term abstinence. “There is more to stopping drinking then just stopping drinking,” he emphasizes. In April 2006, the FDA approved naltrexone extended-release, injectable suspension for the treatment of alcohol dependence in patients who are able to abstain from drinking in an outpatient setting and who are not actively drinking on therapy initiation. It must be administered by a healthcare professional and used in combination with psychosocial support such as counseling or group therapy, according to approved indications. The recommended dose is 380 mg delivered intramuscularly every four weeks. Its use is contraindicated in patients receiving opioid analgesics, who have current psychologic opioid dependence or a positive urine screen for opioids, or who are in acute opiate withdrawal. Patients must be opioid free for a minimum of seven to 10 days prior to initiation of therapy to prevent symptoms of opioid withdrawal or exacerbation of a preexisting subclinical abstinence syndrome. Adverse events associated with naltrexone injections are generally mild to moderate in intensity; in clinical studies, nausea, vomiting, headache, dizziness, fatigue, and injection site reactions were most commonly reported. Naltrexone is associated with a risk for hepatocellular injury and should not be used in patients with acute hepatitis or liver failure. It should be used with caution in patients with mild to moderate liver impairment. Patients undergoing therapy should be monitored for signs and symptoms of depression or suicidality. According to Jennifer Snyder, senior manager of public relations at Alkermes, Inc., the drug’s manufacturer, “This formulation requires only a once-a-month drug treatment that eliminates the need for patients to make a decision to take their medicine every day. It can enable patients to get a monthly amount of medication in a single injection, so that patients and their families can be assured that the person gets the medication for the whole month.” Snyder estimates that approximately 10,000 patients have received the new injectable formulation since its launch in 2006.